One of the world's oldest continually inhabited cities, Varanasi has seen human settlement as far back as the 11th century BC. The city is one of the holiest sites in Hinduism. Countless pilgrims come here to bathe in the Ganges and wash away sin, or simply to die, hoping for nirvana in the afterlife. The 'city of light' is an intense mix of colour, sights, sounds and smells. Among many astonighing sights are the more than 100 ghats (literally 'steps') leading down into the Ganges. These are the sites of bathing and burning, where intimate rituals of life and death can be witnessed in public. Manikarnika Ghat is the most auspicious place for a Hindu to be cremated. Visitors can watch quietly, from a respectful distance, with strictly no photography. Dasaswamedh Ghat (the 'ghat of ten sacrificed horses') is the liveliest and most colourful ghat, where every evening visitors can witness the ganga aarti (river worship) ceremony. It is also a good place to arrange a dawn boat trip, to watch the beauty of Varanasi manifest at the sun rises over the city. Assi Ghat, where the river Assi meets the Ganges, is an important site of worship for pilgrims who come to pay homage to a phallic image of Shiva beneath a peepul tree. Dotted around the ghats are numerous temples, the highlight being the Golden Temple, with its resplendent towers. 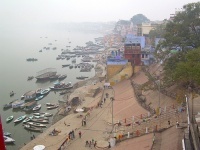 Varanasi is world-famous for its silks, and silk brocades, and does a roaring trade with pilgrims and tourists alike. The city is home to many poets, musicians, novelists and philosophers. Visitors are strongly encouraged to spend some time in the city's tea-houses and local restaurants, where they are guaranteed to be embroiled in some fascinating conversations.